I'm proud to announce that today, I finished the Imperial agent class story for the third time! 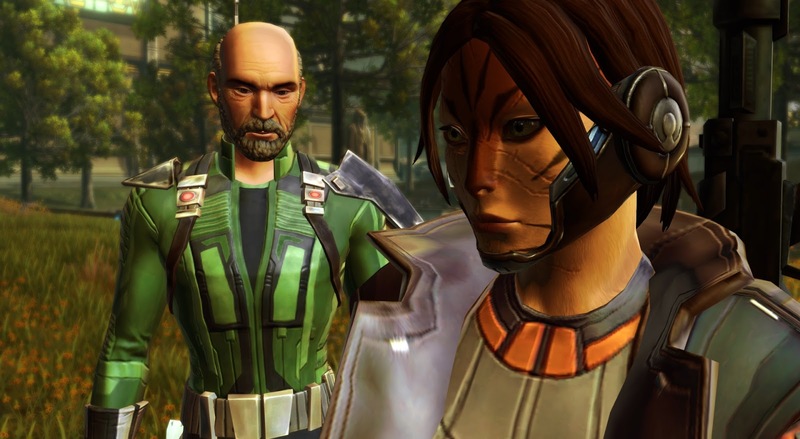 Yes, that means that I finally completed it on the Cathar agent that I created on the Progenitor over two years ago. It's funny to me that the agent surged to the top alongside the smuggler, because only a year ago the class was lingering at the bottom with only one completion along with the Jedi knight, but then I levelled my DvL agent and well, here we are. The agent is definitely a prime candidate for a class story replay in any case, as all three endings that I've seen so far had a distinctly different feel to them. I don't know if this is a high number of class story replays to have done in total, but it doesn't feel like it to me, not after five and a half years. As much as I love the class stories, I generally prefer to spend more time on repeating content that was actually designed with repetition in mind, such as flashpoints and PvP. I actually have four troopers at max level for example, it's just that two of them haven't actually done their class story. Now I just need to give that lowbie knight of mine some love to complete my second playthrough of the Jedi knight. The problem is that she's such an old character and I've picked her up and dropped her again so many times that I can barely remember what sort of characterisation I tried to go for in her story. This is a problem I have quite often when trying to level alts this way. At least with the agent I remembered clearly that this last one was supposed to be evil. 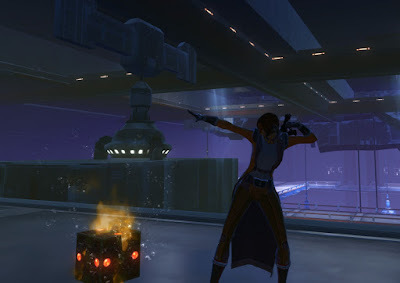 I only found out by chance while googling for something else that agents that side with Jadus have a special bonus quest on Hoth, given by an NPC called Lalya Verron, located in the Imperial base by the Starship Graveyard. Since I had only focused on my class story on that planet, I had completely missed that extra quest giver with a purple triangle above her head. Fortunately I was still able to go back later and complete it then. In terms of mechanics it's nothing too exciting, but it's still cool to see all those small touches that were included in the base game and which can still surprise you even after more than five years. I also had to note once again that bringing different companions along to missions really helps to spice things up while playing an alt of a class you already know. I'd previously always left Kaliyo behind on my ship and found some of the commentary she offered quite interesting. Since this agent is my only character on the Progenitor, she didn't get to benefit from any legacy perks while levelling (oh rocket boost, how I miss thee)... but I also had a reason to go datacron hunting again, and it's actually been pretty fun. I got all of them up to Corellia except for the one on Belsavis for which you need the Rakata Energy Cubes, but I'm not holding out too much hope for getting the ones on Makeb and onwards, as I needed help with most of those even on my main. Still, it's been fun to remind myself of some of those jumping puzzles and my memory of how to tackle them was overall pretty good. For all the convenience of legacy-wide datacrons, I do think it's a bit of a shame that there's no benefit to collecting them on alts nowadays unless you completely start over on another server like I did in this case. Best one of the series so far. Keep up your good work on Youtube and in this Blog of course. Thank you. I literally stumbled into someone volunteering flagship transport to the one of Makeb that's guano nuts to get; and jumped right on that. The next week I got someone who was ready to pop the rock for the Rishi set, everybody come and get it. (Needless to say, I ran there as fast as my speeder would take me). The only stats 'cron I'm missing is the ones on Fleets (if I do one, I think I get the cheevo and the title? that's what the interface says), and I've got a couple of the color shard ones to do (including the belsavis one that you need the energy cubes for). I did note last year that they put in a graphics gribbly to prevent soloing the Quesh datacron, as you used to be able to do (and I was never able to do myself). I was never able to solo the Quesh datacron, just to duo it instead of using the obviously intended three people. I was fortunate enough to get someone to help me with that one on this agent. I duoed it, it didn't seem that hard, though I guess I can see where 3 would help. Well, the intended setup is one person outside and two people for the panels on the inside. I've heard it was possible at some point to solo the two inside panels with a speed boost but have never actually seen it done. Maybe with phase walk? I just know you could lose the outside clicker because from a certain angle you can/could trigger the outside panel from the inside. That's what they changed - they put in a structural element to block the ability to hit the outside panel from inside the room. You can hit the two inside switches and get to the door that opens thereby with the 15 seconds of rocket boost; the timing isn't THAT tight. That was how my wife and I did it, taking turns on the door switch and inside. I think, anyway, I don't recall for sure, we may have just used the mount-while-moving perk. I just feel the urge to say that I learned that actually, the Quesh datacron is still soloable - I successfully did so yesterday. I had no luck at the western entrance, where I usually got in, but at the eastern door I just about managed to squeeze in while still accessing the panel from the outside. I do wish they would add a small xp gain for using the datacrons even if you already have the legacy stat bonus. I'm playing around with leveling a character on a low-pop server and I'm finding being able to get them again is a nice piece of questing flavor.